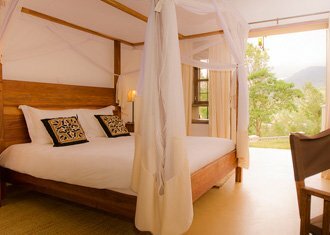 The North of Tanzania is expensive, and these lodges cover all the good areas, while not breaking the bank! 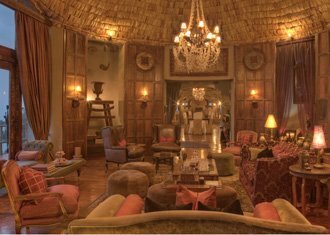 Opened in 2010, Ewanjan Tented Camp perfectly located in the central Serengeti area of the Seronera Valley, famous for its abundant resident game and large prides of predators. Ewanjan has a great setting away from the crowds, ideal to fully experience the wildlife of this area without constantly meeting another vehicle. Lovely levels of accomodation and guiding in the North, with a gorgeous and secluded beach break to finish. 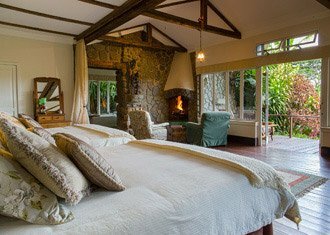 Plantation Lodge is probably our favourite coffee plantation in the Ngorongoro Highlands. It’s tranquil, scenic and in a great spot for easy access to the Ngorongoro Crater and Lake Manyara. The rooms are simple but luxurious and the food is particularly good as they make use of their fine organic vegetable garden. There are other great places such as Gibbs Farm in the area but we feel that Plantation is setting the highest standards at the moment. 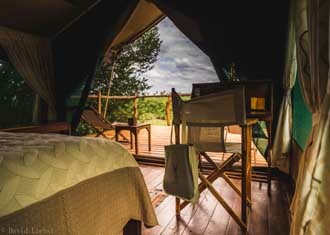 Kimondo is a top luxury mobile tented camp. It takes up the two major locations for the great migration over the year - North and South Serengeti. In the north it sits on the Lamai Wedge with only two other camps. This means you get river crossings without the other vehicles. Great food, beautiful tents, engaging guiding. Farm life at Gibbs, great guiding in the Serengeti and an absolute favourite on Zanzibar. 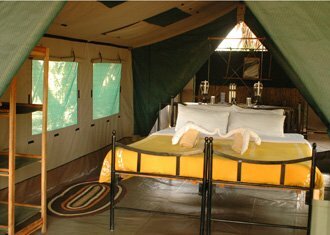 Nomad Tented Camps have evolved from a true passion for guiding safaris here. The quality of guiding and positioning of the camps depending on the seasonal movement of the herds makes for an awesome safari experience. Even the 'light' camps are comfortable and designed with style. Stunning levels of accommodation throughout. Crater views from your room, private reserve in the Serengeti; this represents best of the best in the North. 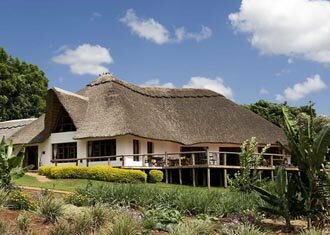 There are few luxury properties in and around Arusha, of all these the Arusha Coffee Lodge is the best. Owned and run by Elewana, this property maintains great levels of quality and service. Being located on a working coffee plantation allows a different sort of feel and air to your stay. A stay in Arusha would normally be a one night stop, at most, two. If you are looking for something a bit cheaper then Onsea House or Machweo Retreat would be our first choice and if they are full then Rivertrees is the next best option. Singita Faru Faru is one of our very favourite lodges. 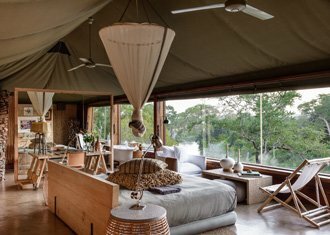 Run by Singita, the lodge is the lovechild of Paul Tudor Jones (a billionaire who runs them as his playthings!) 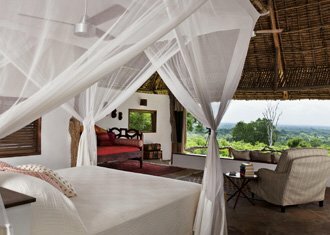 and Faru Faru can be counted as probably the best safari lodge Tanzania. One of three of their supreme properties (Sasakwa and Sabora being the others) it forms part of the private Grumeti Reserves, situated in the west of the Serengeti. Yet because it’s a private park you can night drive, horse-ride and walk. A modern interpretation of a classic safari lodge, it has intimacy, luxury and excellent guiding in spades. 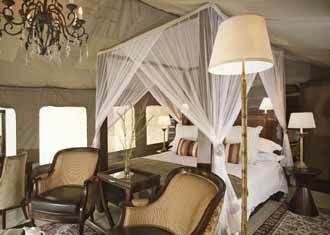 The finest of &Beyond....crater, luxury mobile tents in the Serengeti and the best beach lodge in Tanzania. 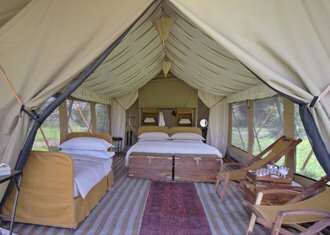 Serengeti under Canvas is one of the most luxurious mobile tented camps in the Serengeti, owned and run by &Beyond who are one of the top safari companies in Tanzania in terms of guide quality and luxury. The camp is very mobile, tracking the migration at all times of the year in a small intimate camp. Great authentic safari camps with a super luxurious pampering and beautiful views to finish. 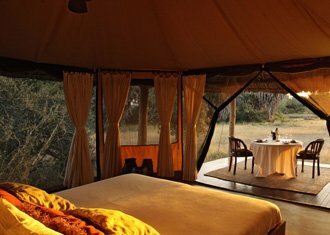 Oliver’s Camp is our favourite camp in the Tarangire National Park. It is a lovely, friendly, rustic camp in probably the best game viewing area in the park. It’s definitely worth a visit if you’re interested in a real, authentic safari experience. Providing that you go between July and November, this camp offers one of the best experiences on the northern circuit. This is one of the more luxurious permanent lodges in the Serengeti offering a wide range of safari experiences, including night drives and walking safaris, with superb guides. Since it is just outside the park itself there is the chance to be away from other tourists. We really love the position of the lodge; sitting raised on a hill with fantastic views into the Serengeti eco system. The service and guiding at Kleins is some of the best in Tanzania, hardly surprising as it is owned and run by &Beyond. A bit of everything here! Grand luxury to start, river crossings, and ending in one of the most remote locations in Tanzania. The south of the Serengeti was crying out for a top permanent lodge and now it has one. 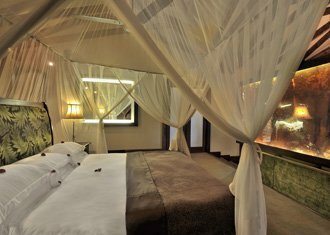 With an amazing location above a rocky gorge and eight classically styled tented rooms, Mwiba is a top luxury lodge. A standard Selous Zanzibar trip. There can be some good honeymoon deals here. 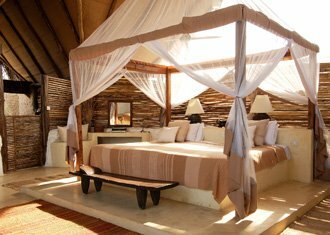 Previously known as Amara Selous, Azura Selous has become a transformed lodge under the luxury brand Azura. The accommodation is of a high standard, with the bonus of air conditioning (one of the only camps with this in Selous) and the rooms being constructed with both canvas and stone and looking out onto the Ruaha River. Great honeymoon option for those looking for a good value luxury camp and secluded beach resort. High end Northern circuit focusing on the central plains, famous for cheetah, followed by the best value private island in Africa! Namiri Plains is a must to any cheetah enthusiast. The cheetah numbers here are vast and there’s plenty of everything else too. Being owned by Asilia, Namiri Plains will most certainly deliver a world class safari experience. Fanjove is the most exciting new beach destinations in Tanzania in recent years - a superb beach and an absolute Robinson Crusoe experience. Stunning beach-safari-beach of the Southern parks. Fantastic accommodation throughout and beach lodges focusing on getting away from the crowds. 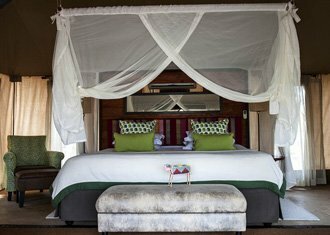 Singita own some of the finest and most luxurious lodges in Africa; Singita Mara Tented Camp is the latest arrival opening in October 2012 on the banks of the Mara River. Horsriding is possible with this one! Best permanent camp for the river crossings and the a big hitter on Zanzibar with fantastic facilities. The Manor is luxury defined. It pushes boundaries in terms of making that extra effort to make sure their guests are stress free and completely pampered. The stunning Ngorongoro Highlands surround The Manor and leave the guests in a permanent state of awe and tranquillity. Chimp trekking in the West of Tanzania is the focus here; while stopping at the best two lodges in the South on the way there. This is a very good safari trip, nicely away from the crowds. Magnificent beach lodges sandwich a short safari in one of the best lodges in the Selous. This is a classy trip. Designed to suit friends and families alike, Singita Serengeti House features comfortable, carefree interiors and a relaxed, unpretentious ambience. Simple classic furniture combining bleached raw woods and a palette of white, ebony and ivory delivers a modern yet quintessentially African feel. Kiota Camp is set in the central Serengeti allowing for fantastic year round game viewing, especiallty if your interested in searching for the big cats at any time of the year. 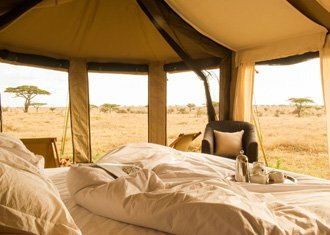 The Camp itself is relativly simple but offers an authentic safari experience, sleeping under canvas in the middle of the Serengeti, surrounded by wildlife, is what life at Kioto Camp is all about. 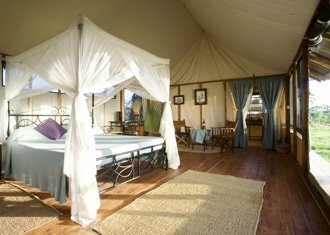 Olakira is one of the finest mobile camps in the Serengeti. It follows the same route as Serian in that it moves twice a year. From July to November they’re in the north of the Serengeti in the Karatu region. Then from December to March they move back down to fantastic spot in the Ndutu plains. 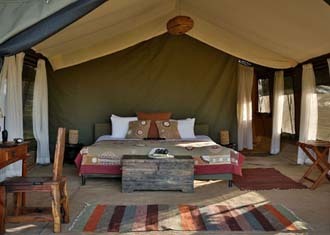 At Olakira you are guaranteed great guiding, lovely food and a luxurious but authentic safari camp. Its position in the north is unbeatable as you can actually see the river crossing from the comfort of the camp. Quiet, away from it, all but with fabulous rooms, great food and friendly unpretentious service. 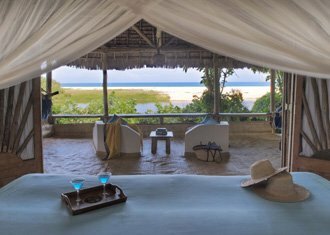 This is the best value beach accommodation and one of the most beautiful small lodges to be found anywhere in Tanzania. In the north of Ruaha National Park, Mwagusi is a rare gem on the safari circuit, a privately owned lodge in possibly the best game area of Ruaha. If you are looking for a serious big game safari, look no further. We’ve been selling Zanzibar for over 20 years and we’re excited for the cool Zuri Zanzibar to open on 1st May 2018 on the Northwest coast of the island. It offers a refreshing alternative to the current options in Zanzibar. Good value Northern itinerary, with camps in all the right places; but the emphasis is on safari, not luxury. The new Maramboi Tented Lodge is set in a picturesque location between the Tarangire and Lake Manyara ecosystems, allowing for a very unique opportunity to view the wildlife in this little visited area. Set within the private managed corridor that also has the up-market Chem Chem and Manyara Ranch. Maramboi is a cost effective lodge for those keen on visiting Tarangire who prefer to avoid the bustle of the northern areas of the park and want to keep costs down.